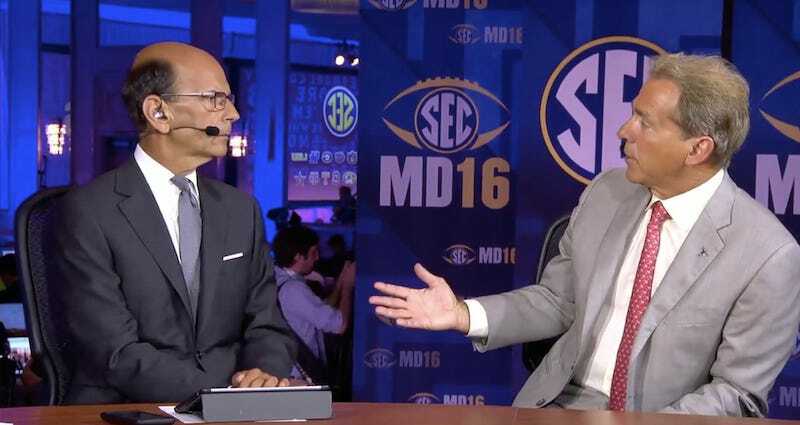 Alabama football head coach Nick Saban, who never seems pleased, seemed especially displeased with radio host Paul Finebaum today on SEC Network. Finebaum asked about his decision to not suspend two players after they were arrested on drug and weapons charges, and Saban pushed back. I want to emphasize once again that the main reason I’m doing this is that I refuse to ruin the lives of two young men who have spent their adolescence and teenage years, working and sweating, while we were all in the air conditioning. Today, Finebaum asked Saban about the program’s critics who see the coach’s lack of punishment as a “very bad look.” Saban said he didn’t really care, and suggested that the police had targeted the two football players in the car of four. “Do you think they were persecuting the football players?” Finebaum asked. Saban didn’t answer the question, but said, “There’s just a lot of questions there that are reasons that there weren’t charges brought against these guys.” The Alabama coach then accused Finebaum of convicting Robinson in the media, and ended the conversation by basically saying he doesn’t care what anyone thinks, because he’ll discipline his players as he sees fit. Good talk, guys. Within earshot of media, Saban launched into a four-letter tirade directed at Finebaum. In it, he used his fingers to note the small amount of marijuana found in the car and insinuated the arresting officers were disgruntled LSU fans. It ended with a few laughs from everyone on set as Saban exited. These two love to chat. What a pair.